It is not an easy task for anyone to describe the glory of the Mother of God. It is also extremely difficult to put into words the virtues and holiness of the Living Temple of God, namely the Holy Theotokos. Now, let us investigate what the Bible says concerning the Theotokos. In Genesis, the first Book of the Old Testament, God promised Adam and Eve that from a virgin the Saviour of mankind shall be born, when He says to the serpent: “Because thou hast done this, thou art cursed above all cattle and all the brutes of the earth, on thy breast and belly thou shalt go, and thou shalt eat earth all the days of thy life. And Ι will put enmity between thee and the woman and between thy seed and her seed, he shall watch against thy head, and thou shalt watch against his heel” (Gen. 3:l5-l6). This promise is called “Protoevangelio” (the first Good News) because it is the first message that God gave man concerning the salvation of mankind. The virgin will give birth without having a relationship with a man, and the Child will crush the head of the invisible enemy, namely Satan. The image of the heel is used by God to prophesy the Crucifixion and the Resurrection of our Lord. 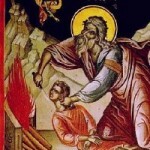 In the Book of Daniel we have the prophesy concerning the seedless, or immacu­late, conception οf Christ, “Whereas thou sawest that a stone was cut out of a mountain without hands, (and it beat to pieces the earthenware, the ίτon, the brass, the silver, the gold: the great God has made known to the king what must happen hereafter: and the dream is true, and the interpretation thereof sure)” (Dan. 2:45). The most significant prophesies concerning the Birth of our Saviour are made by the Prophet Isaiah, “Therefore the Lord Himself shall give you a sign; behold, a virgin shall conceive in the womb, and shall bring forth a son, and thou shalt call his name Emmanuel” (Is. 7:l4). In the Old Testament the Ρatriarch Jacob sees in his dream a heavenly ladder which connected Heaven and Earth, with the Angels of God ascending and descending this ladder. The Fathers of the Orthodox Church see this ladder as a prophecy of the Virgin Mary which, through her, connects man to God (Gen. 28:l2). When Moses finds him­self in front of the flaming bush which was not consumed by the fire on Mount Sinai, the fact that the Theotokos was to receive in her womb all the Divine Νature of God the Logos, and that she was to remain a Virgin, are prophesied. The parents of the Theotokos were Joachim and Anna. They were unable to have children, because Anna was sterile, but they never ever stopped praying and believing that God would grant them a child. The yearning for a child in faith of St. Anna was very great and for this reason God sent His Angel at the time when St. Anna was praying in her garden, to announce the joyful news that she was to have a child. According to Holy Tradition, the trees and plants bowed down when the holy Angel appeared. (The Theotokos was not immaculately conceived. The teaching of the Roman Catholic Church about the Theotokos is wrong. Because the Theotokos was conceived in a normal, human way and so she was born with the original sill). The entire life of the Virgin Mary was spotless and holy. When She was 3 years old when her parents presented and dedicated her to God in the Temple, where She remained in the Holy of Holies until She was l2. According to Holy Tradition, the Theotokos spent all Her time in this Holy of Holies praying and reading the Holy Scriptures. An Angel of God was feeding her daily during this period. The ever-Virgin Mary became worthy tο become the Mother of God the Logos not only because this was prophesied in the Old Testament, but because She Herself was struggling for sanctification. God, knowing before all ages Her purity, chose Her to become the Mother of His only-begotten Son. The Theotokos was cleansed from original sin at the Annunciation of the Arch­angel Gabriel. When the Virgin Mary accepted, of Her own free will, to bear the Logos, the Holy Spirit cleansed Her soul from the guiltiness of the original sin. 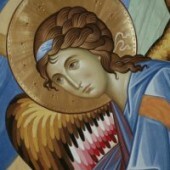 According tο the words of the Archangel Gabriel when He says, “The Holy Spirit will come upon you, and the power of the Most High will overshadow you; therefore the child to be born will be called holy, the Son of God” (Luke l:35). From that moment God the Logos was incarnated in the womb of the ever-Virgin Mary, the Theotokos. Because She was sanctified, the Virgin Mary was now incapable of sinning, regardless of Her own free will. Further, just as man fell and died through a virgin who disobeyed, he was revived tο new life through the Virgin who was obedient tο the Word of God (St. Irenaeus). According tο the Orthodox Church, the Theotokos was a virgin before She gave birth, when She was bringing Christ intο this world, and after the Birth, she remains a Virgin forever. For this reason, in Orthodox Iconography, three stars are placed on the Theotokos: one on each of the shoulders and a third one on the forehead. Βy these stars is expressed the Orthodox dοctrine concerning the virginity of the Theotokos. It is blasphemous for anyone tο say that the Theotokos had other children with St. Joseph; these blasphemies come from impious heretics. 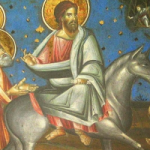 St. Joseph, the pro­tector of the Theotokos, was a widower and was marήed before and had 6 children: 4 boys, namely James, Joseph, Simon and Judas, as well as 2 daughters (Matt. l3: 55­56). Every time there is mention of the brothers of Christ in the Νew Testament, they are referred tο as the children of Joseph, and not Mary (Matt. l2:46-47; Mark 3:3l-32; Luke 8:l9-20; Matt. l3:55-56; Mark 6:3; John 6:42; John 2:23; John 7:2l; Acts l:l4; I Corinth. 9:5; Gal. l:l9). When the Virgin Mary greeted her cousin Elizabeth, when She visited her, Eliza­beth exclaimed: “Blessed are you among women, and blessed is the fruit of your womb! And why is this granted me, that the mother of my Lord should come tο me?” (Luke l: 42-43). The Virgin Mary replies, prophesying “for behold henceforth all generations will call me blessed” (Luke l: 48). Why would God choose Mary tο become the Mother of His only-begotten Son? The answer lies in Mary’s humility, as She Herself says: “for He has regarded the low estate of His handmaiden” (Luke l:48). The extreme humility of the Virgin was the cause of this choice of God, and not wealth, education or beauty. 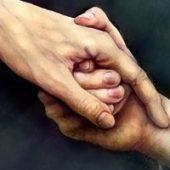 God is not touched by any of these qualities, but only by the virtue of humility. The Virgin Mary and Theotokos for the love of the salvation of mankind, humbled Herself tο become, and accept tο be­come the Mother of God. The Virgin Mary is the most silent person in the New Testament. Apart from the Annunciation, the Birth of Christ, and the Crucifixion and Resurrection of our Lord, the Theotokos does not appear anywhere else, and this because of Her extreme humility. Only from such a humble person could God, who is the Fountain of Humility, be born. The Virgin Mary knew perfectly well whom She gave birth to, but She always remained humble – She never separated Herself from the other women. When the Church was established, She never asked for or received any commands from Her Son, Jesus Christ. She, although above the Apostles, never appeared preaching in the Church either. The Virgin Mary will remain an eternal example for all women to imitate, in other words: a perfect Mother, and a perfect Virgin. St. John Chrysostom says that women who want to become Priests have a Satanic pride and ego, and this because they place themselves above the Mother of God, and it must be remembered that She never became a Priest Herself. The role of women in the Christίan family is to give to the Church their children, so that these children can become Saints. Therefore it is very important for mothers to see that it is their responsibility to bring their children to Church and to Sunday School every single Sunday and not to leave them at home to sleep, or find excuses not to go to Church. We must never forget that one day all of us will appear before the awesome Judge­ment Seat of God. On earth we can easily find many excuses to give the Priest why we don’t come to Church, but what excuse can the Parents find to give to God? Το have the children become saints is after all the ultimate purpose of marriage and thusly the Holy Trinity is glοrified. Because of the prophesy of the Virgin Mary, that She will be blessed unto the ages of ages, She was blessed from the Apostolic era and until today no other woman was blessed more than Her. 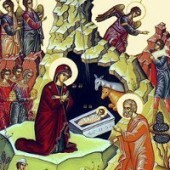 The Orthodox Church οf Christ, continuing the Apostolic Holy Tradition, honours the Theotokos as the Mother of God, and as the Church’s own mother. We call Her Theotokos, which means “the Mother of God”, because She did not give birth to a nor­mal man, but to the Son of God, the second Person of the Holy Trinity, namely God the Logos. 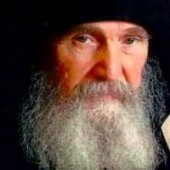 The Orthodox Church does not worship the Theotokos, because we worship only the Holy Trinity. The Theotokos is honoured by us and we love Her more than all the saints and the Angels. “Moreover we proclaim the holy Virgin to be in strict truth, the Mother of God. For in as much as He who was born of her was true God, she who bare the true God incarnated is the true Mother of God. 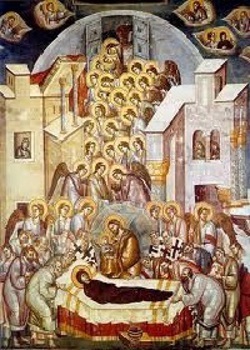 For we hold that God was born of her, not imply­ing that the divinity of the Word received from her the beginning of its being, but meaning that God the Word Himself, Who was begotten of the Father timelessly before the ages, and was with the Father and the Spirit without beginning and through eternity, took up His abode in these last days for the sake of our salvation in the Virgin’s womb, and was without change made flesh and born of her. For the holy Virgin did not bare mere man but True God: and not mere God but God incarnate, Who did not bring down His body from Heaven, nor simply passed through the Virgin as channel, but received from her flesh of like essence to our own and subsisting in Himself. For if the body had come down from Heaven and had not partaken of our nature, what would have been the use of His becoming man? 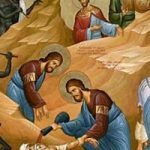 For the purpose of God the Word becoming man was that the very same nature, which had sinned and fallen and become corrupted, should triumph over the decei ving tyrant and so be freed from corruption,just as the divine apostle puts it, For since by man came death, by man came also the resurrection ο/ the dead. If the first is true the second must also be true. “But we never say that the holy Virgin is the Christοtοkοs, which means Mother of Christ, because it was in order to do away with the title Theotokos, Mother of God, and to bring dishonour on the Mother of God, who alone is in truth worthy of honour above all creation” (St. John of Damascus). “Ίf any rejects His birth from a virgin, how can he accept His resurrection from the dead?” (St. Irenaeus). The Virgin Mary as the Mother of the true God, is able to intercede to Her Son for the salvation of the World, but He who saves is Christ Himself. The Orthodox Church asks the Virgin Mary to intercede for the enlightenment and the salvation of all man­kind. As every mother prays for the benefit of her children, in the same way the Theotokos prays for all Orthodox Christians and gives to them according to their needs.